(Nanowerk Spotlight) Advanced electrical energy storage systems are primarily based on lithium-ion battery (LIB) technologies. Graphite is the standard anode material that is successfully and cheaply employed in commercial LIBs, demonstrating the highly desirable flat voltage/current response expected for powering modern devices. There is increasing concern about the use of LIBs for large-scale applications like electric vehicles due to the cost disadvantage and the overall global scarcity of lithium. Sodium is an attractive alternative to lithium because of its markedly lower price and its much wider global abundance. Unfortunately graphite is not suitable for sodium ion battery (SIB or NIB) anodes, since the 60% larger sodium ions will simply not fit within the lattice structure. There are also currently no other NIB anode candidate materials that offer the needed voltage/current characteristics. Researchers in Canada have now demonstrated that it is possible to achieve graphite-like charge/discharge behavior in a NIB anode through a controlled dilation of the intergraphene spacing in a tailored carbon. "We utilized common peat moss as the carbon precursor, tuning the synthesis process to create macroscopically open nanoscale pseudographitic structures that also offers a unique high rate capability and superb charge - discharge cycling stability," Zhi Li, a post doc researcher in David Mitlin's group at the University of Alberta, tells Nanowerk. In previous Nanowerk Spotlights we reported on the group's innovative use of biomaterials to fabricate supercapacitor electrode materials from eggshells ("Converting eggshell membranes into a high-performance electrode material for supercapacitors") or hemp ("A nanotechnology use for hemp"). In their new work, the scientists demonstrate that peat moss serves as an ideal environmentally benign and inexpensive carbon source, being one of the most abundant wild growing plants on the planet, with peat land – land with a naturally accumulated layer of peat moss – covering around 3% of the earth. Electrode material fabrication involves pyrolysis and activation, the former process locking in the CO2 present in the plant and giving the synthesis process a negative CO2 footprint. 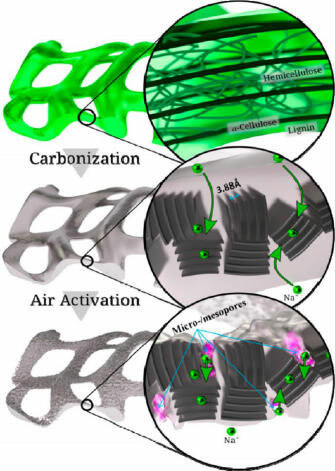 "Taking advantage of the cross-linked organization of the polymers in the peat moss cell wall, we achieved highly ordered pseudo graphitic structures with a highly dilated graphene interlayer spacing," explains Li. "This allowed for facile sodium (Na) intercalation into the carbons' bulk, while the high level of order created a chemically homogeneous environment for the inserted ions and hence relatively flat voltage profiles." Prof. David Mitlin emphasizes that, until their publication, it was taken for granted that Na intercalation – storage of ions in bulk rather than on surfaces – into a carbon is impossible at the low voltages needed for a useful anode in a commercial battery. "People basically assumed that the sodium simply plated out as a metal onto the surface of the pores in the carbon," says Mitlin. "This created a perceived fundamental limit to what could be achieved, since plating even at the nanoscale is not desirable (safety concerns) and porosity was limited." This scientific misunderstanding was understandable in light of the fact that researchers have been unable to create highly ordered carbons but with a sufficiently dilated intergraphene spacing (basically a swollen graphite) to insert the Na ions into the bulk structure. The University of Alberta team were able to achieve this by marrying the chemical attributes and the physical structure of the precursor plant to a customized heat treatment. In addition to achieving great electrochemical results, they were able to conclusively demonstrate, using X-ray diffraction, that intercalation is indeed possible in biomaterials like the peat moss used here. "Since the carbons we achieved with our method display superb (some of the best reported in literature) electrochemical performance in numerous respects – including total reversible capacity, cycling stability, rate capability, charge/discharge voltage hysteresis – this should, combined with the green and economical method for synthesis, make carbonized peat moss a highly attractive practical NIB anode material," concludes Mitlin.